This week Guy talks about sugar snap peas, tomatoes, spinach, hispi cabbage, carrots and kohl rabi. To prepare, break the end and strip it down and it will take the string out. Take the string off each side and then you can steam or boil (for 3-5 minutes). You also can eat them in a stirfry or raw. We’ve just come into the tomato season and have had good sunlight so they taste really sweet. Try making your own fresh salsa by chopping them, adding red or fresh onions and a green herb and well as a squeeze of lemon, vinegar and a bit of sugar, salt and pepper. It’s great with tortilla chips or on a courgette fritter. They are tasting fantastic. Don’t bother peeling them. If you want to cook them, theyre great if roast them with kohl rabi. Peel and chop the kohlrabi and roast with the carrots for around 30 minutes. True spinach has fine and succulent leaves. Wash it, leave the water on and cook it in a pan, turn it over, take it out push it into a colander, chop it up finely and then you can use it in all sorts of ways. Shred these finely, blanch and drain. You could add a squeeze of lemon as well as a little bit of butter and pepper. This week Jane talks about bunched carrots, radish and cucumber, cherry tomatoes and french beans. Rather than peel bunched carrots, you can just wash them. Try roasting them in the oven with a bit of cumin and then mashing them before adding olive oil and feta. Try thinly slicing the radish and cucumber and mixing it with a bit of smoked fish. You can bind it with some creme fraiche and horseradish. You don’t have to do too much with these. They go well with mozzarella, so you can slice them up with mozzarella, olive oil and basil. The season’s just started so you’ll see a lot more of them over the coming weeks. Top and tail them and blanch in boiling salted water for a couple of water. They need to have a squeak when you bite into them. Try tossing them with shredded slow cooked tomatoes, diced olives and fresh basil. We’ve been tasting carrot varieties today, all grown on our French farm in the Vendee. Our stored Devon carrots last until the beginning of May and we have a 4-5 week gap when we import carrots to fill the gap before our Devon bunched carrots come into season. The plan is to bridge this gap with carrots from our French farm and as we tasted 8 varieities the decision was unanimous – Namur is the best. So you’ll be seeing these in the boxes this time next year. There is always a carrot gap at this time of year as our stored crop comes to an end. We had planned to plug this with some Spanish carrots, but we were already dubious about their environmental credentials and when the price we had agreed with the growers mysteriously doubled, we decided to give you a carrot holiday rather than offer you over-priced sticks of what often turns out to be tasteless orange water. 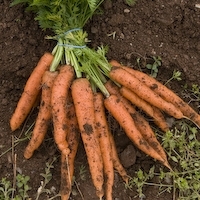 We hope this break will sharpen your appetite for the first harvest of our bunched carrots. And by next year we hope to have early carrots from our French farm. There is no doubt that unwashed roots retain their protective skins and keep better. I live a muddy life, but having cooked in some of your kitchens I am wondering if I have been excessively dogmatic about the stuff; would it be better for us to do a quick wash (as we have the last few weeks when the carrots have been very muddy)? If kept in the fridge and eaten within two weeks I think the effect on flavour will be negligible. It would also help us to reduce packaging because there would be less need to contain dirt and the boxes would stay clean(ish) for more trips. If you would like to share your views on this topic, we would be very interested to hear what you think. 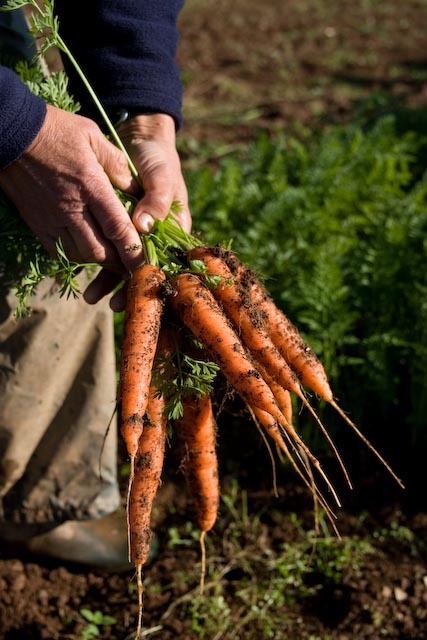 Sainsbury’s may have rejected organic carrots grown by the Prince of Wales and Soil Association founder Patrick Holden, but Riverford has bought them – all 25 tonnes. Riverford’s Andy Johnson said, “Our customers are very discerning people who demand tasty carrots and they absolutely loved them.” What was Sainsbury’s problem? Some of you have already commented on the media hoo-ha over Sainsbury’s rejecting the head of the Soil Association’s carrot crop. As the eventual buyers of Patrick Holden’s carrots, we think that this saga highlights the lunacy of the supermarkets’ controlling and overly centralised approach to buying and selling food. Sainsbury’s said they rejected the carrots because they were destroyed by rot. The fact is that we eventually bought over half Patrick Holden’s crop in grade A condition and our veg box customers loved them – rightly so because they were great. When it comes to rejecting crops, the supermarkets like to make out that their hands are tied. The reality is that they are incredibly prescriptive in what they deem acceptable. Shape, size and minor blemishes all lead to rejection, waste and a financial squeeze for farmers. The supermarkets demand that 75% of a crop is packable which is why the farmers that supply them are often forced to focus on appearance at the expense taste. It doesn’t have to be like this. Veg box schemes like ours cut the supermarkets out of the distribution chain and this has to be good for both farmers and for customers. There is life beyond the supermarkets and it tastes good.